or Port Said Priced from $720 per person in a party of two. For larger parties, please see complete price table below. 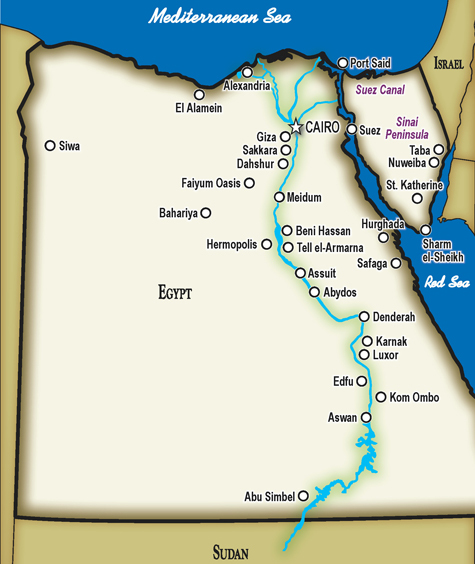 2-day private Cairo shore excursion from Alexandria or Port Said. You will be met at the port by a Ya'lla Tours Egypt representative and transferred to Cairo where you will meet your private guide and begin your tour (about a 3 hour drive). At Giza, visit the Pyramids, the Valley Temple, and the Sphinx. Then visit the Solar Boat, one of the most amazing Pharaonic discoveries. Lunch on route. Continue to Sakkara to see the prototype of the pyramids, the Step Pyramid, built for the 3rd Dynasty Pharaoh Djoser by the exalted architect Imhotep. Return to Cairo for overnight. Drive to the Egyptian Museum of Antiquities for a tour. Among other fascinating exhibits, see the treasures of the Tomb of Tutankhamen and the extraordinary Mummies Room. Continue to the Mohammad Ali Mosque and the citadel of Saladin. Lunch on route.